No modern kitchen is complete without a modern refrigerator. Today’s refrigerators offer a host of innovative and advanced features that provide exceptional storage for fresh food and frozen items alike, keeping delicious ingredients preserved before you turn them into gourmet meals. Universal Appliance and Kitchen Center offers a vast variety of premium refrigerators in luxury designs, helping you find the perfect choice for your home. For traditional style and features, consider investing in a top mount refrigerator or bottom mount refrigerator. 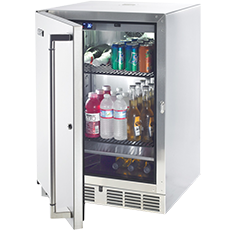 If optimal organization and storage space are your priorities, a French door refrigerator is an excellent choice. If you’d like a similar amount of fresh food and freezer storage in one unit, consider a side-by-side refrigerator. Should your needs be more specific, you can always invest in a specialty refrigerator. There are even all-refrigerator units that provide dedicated storage for fresh food items, and freezer units that provide ample space for frozen goods. Universal Appliance and Kitchen Center also offers an array of refrigerator accessories to help you maintain, repair, and customize your home’s premier food storage appliance. No matter your refrigerator needs, Universal Appliance and Kitchen Center is here to help. We offer a wide range of the best refrigerators and best freezers from premium brands including Miele, Sub-Zero, KitchenAid, Jenn-Air, Thermador, Bosch, Gaggenau, Viking, Dacor, Monogram, and many more. Let us help you find the perfect addition to your home today.